Winfried Engelbrecht-Bresges, the Chief Executive Officer of the Hong Kong Jockey Club, opened the 35th Asian Racing Conference at the Hong Kong Convention and Exhibition Centre this morning (6 May) with a keynote presentation for the session titled ‘Racing’s Lifeblood – the future landscape for wagering’. 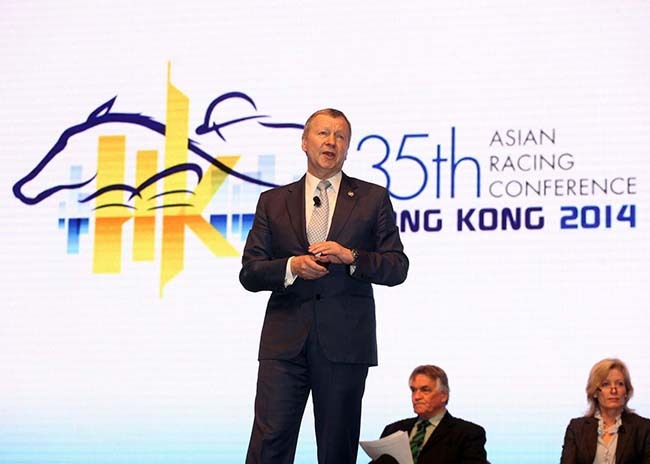 Winfried Engelbrecht-Bresges, Vice Chairman of the Asian Racing Federation and Chief Executive Officer of the Hong Kong Jockey Club, speaks at the conference’s first plenary session, “Racing’s lifeblood – the future landscape for wagering” today. 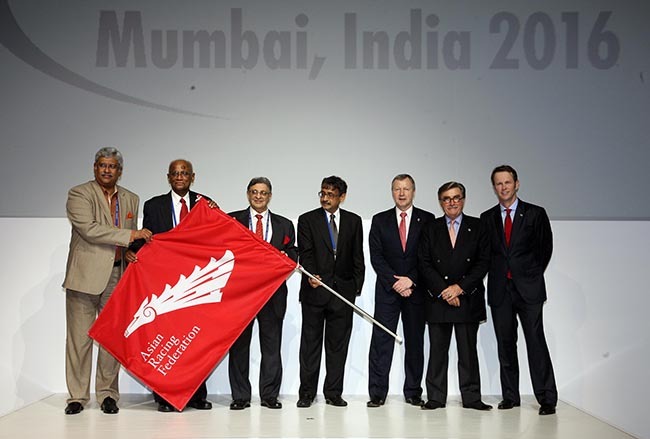 As chair of the three-day convocation’s first session, Mr Engelbrecht-Bresges, who is also Vice Chairman of both the Asian Racing Federation (ARF) and the International Federation of Horseracing Authorities (IFHA), pointed out the differences between horseracing and other major sports, which gain their revenues from sponsorship, merchandising, broadcast rights and event-day contributions. He stated that racing brings in only about 15% of its revenue from those streams enjoyed by other sports, while on average 65% of racing’s revenue comes from wagering. He said: “We have to invest heavily in racecourse facilities to meet customer demands; we have to invest in customer services, in marketing programmes and technology in light of the significant increased competition we face. We have to realise we are not only competing in a wagering market, in the end we are in the entertainment market. With race betting set to remain flat through to 2017 and sports betting turnover set to exceed that of horseracing for the first time this year, Mr Engelbrecht-Bresges forwarded two major factors “critical” to the development of the racing industry: “regulatory environment and governance” and “value creation”. He also shared the HKJC’s vertically integrated model, which controls all aspects of the industry, and eventually enabled the Club to initiate changes to revitalise racing and to create relevance to customers, which as a result created a significant increase in income. He said that in-depth customer analysis had identified eight different customer segments, and, after looking at customer behaviour holistically, the Club is tailoring the racing experience to those groups. In the last four years, said Mr Engelbrecht-Bresges, thanks to the HK$3.5 billion invested since 2009 in the Racecourse Master Plan, a far-reaching redevelopment of racecourse facilities, the implementation of a customer segmentation programme and the engagement with integrated new technology for greater customer connectivity and participation, turnover has increased by 41%. Jennifer Owen, an independent consultant to the gambling industry who has researched and analysed the gaming market since 1996, delivered the findings of her landmark study titled ‘The Future Landscape for Wagering: Market Analysis and Implications’. She suggested that a direct financial linkage needs to be built between racing and betting in every market to incentivise innovation and growth, regardless of the ownership model. In emphasising the need for racing to engage a younger and wider customer base, Ms Owen also drew attention to various current trends attendant to horserace gaming within the six major jurisdictions (Japan, Hong Kong, USA, UK, Australia and France), one being the notable need to innovate in the face of technological advancements. The rise in the use of mobile devices for placing bets was forwarded as one significant trend. “Digital is the new shop front,” she said. Breon Corcoran, Betfair CEO, highlighted the significant journey of growth that his company has been on since facilitating the first wagers between customers in 2000. One of the recent international highlights has been the purchase of TVG in America, which broadcasts high definition racing coverage into 30 million homes across the country. Under Betfair’s ownership, TVG has now become the leading online betting operator in the USA and has also recently concluded a commingling deal with the HKJC, allowing American customers to bet into the Hong Kong pools and watch Hong Kong racing. Paul Bittar, CEO of the British Horseracing Authority highlighted the significant challenges faced by a racing jurisdiction that has the most heavily deregulated betting industry in the world, combined with an industry that, compared with the Hong Kong model, is “non-vertically integrated”. He said that this means that the BHA has a tough job to ensure that those who provide the racing product get a fair return for their contribution. On a more optimistic note, Mr Bittar mentioned that there is now a realistic prospect in the UK of a genuine commercial replacement to the Levy system of funding, which has changed very little since the 1960s. “We are looking to get into a position in which the government has no direct involvement in the funding of racing. David Attenborough, the head of Tabcorp in Australia discussed the challenges that legal onshore corporate bookmakers are posing to the business, as taxation legislation gives them the chance to offer tote products at a much lower margin than Tabcorp. Tabcorp currently returns 8.9% of its turnover on racing back to the sport – for the bookmakers that figure drops to 1.8%, giving the latter a big advantage. Mr Attenborough told the delegates that Tabcorp is now investing heavily in three key areas, which he categorised as: Customer; Channel; and Product.